Hello, ladies. How’s your week going? Its way too hot down here, the ac doesn’t seem to help much and to tell the truth I’m dreaming about Fall and Winter. It is as hot where you live? 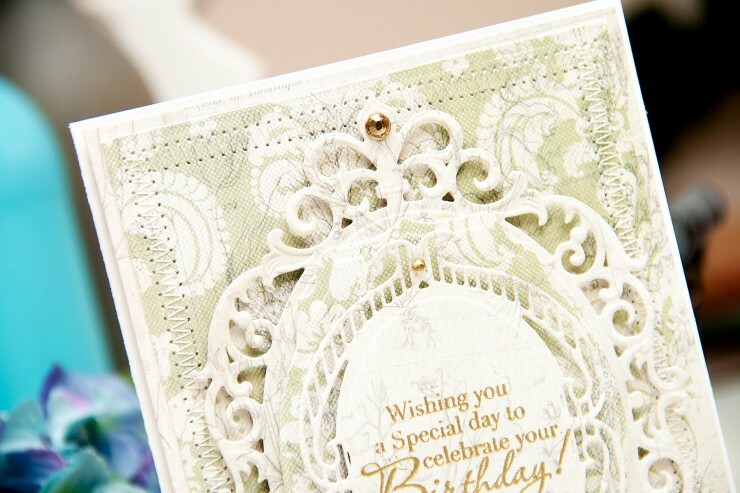 Today I have a Birthday card to share using some of my favorite products – dies from Spellbinders, papers from First Edition and stamps from Stampendous. If you’ve been following me for some time you know this is my favorite product combo for Spellbinders cards. I used fabric textured papers from First Edition (Botanical Tea collection) for this project. This paper is like no other, there are sheets with various special effects, fabric texture being one of them. It really feels like fabric to the touch, very unique. Create 5″x7″ side folding card base out of white cardstock. Cut/emboss base panels using 5×7 Matting Basics A and B dies #7, add zig zag stitching with the help of sewing machine. Adhere base panels onto card base using foam adhesive. Cut/emboss Fleur de Elegance S4-475 dies #2 and 3. Adhere die cut #3 onto base panels using foam adhesive. 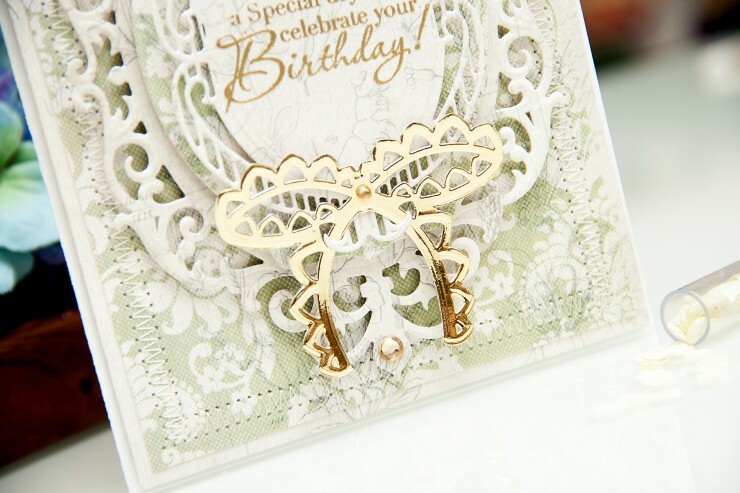 Heat emboss Birthday sentiment onto die cut element #2 using Stampendous stamps and gold embossing powder. Cut/emboss Labels Thirty Six S4-418 die #5. Adhere using foam adhesive. Adhere sentiment die cut on top using foam adhesive. Cut/emboss one of the bows from the Bow Couture S4-449 set out of gold mirror cardstock. Adhere to card. 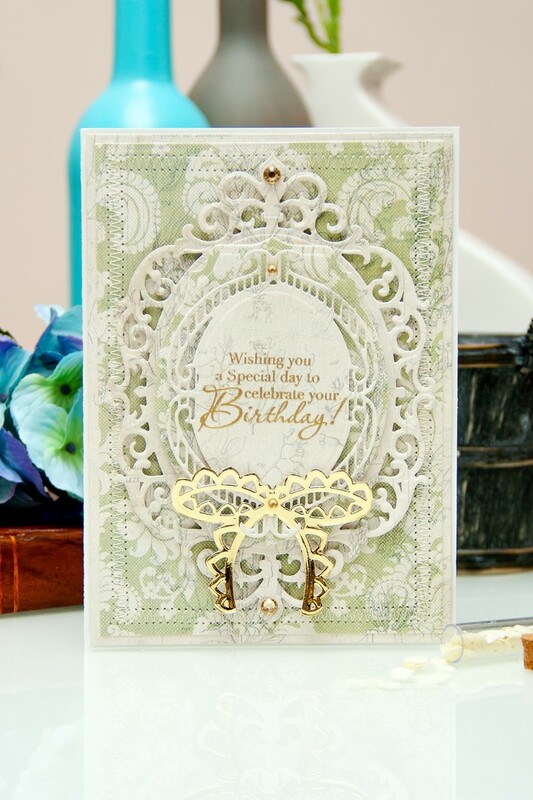 Embellish card with gold gems and enjoy! 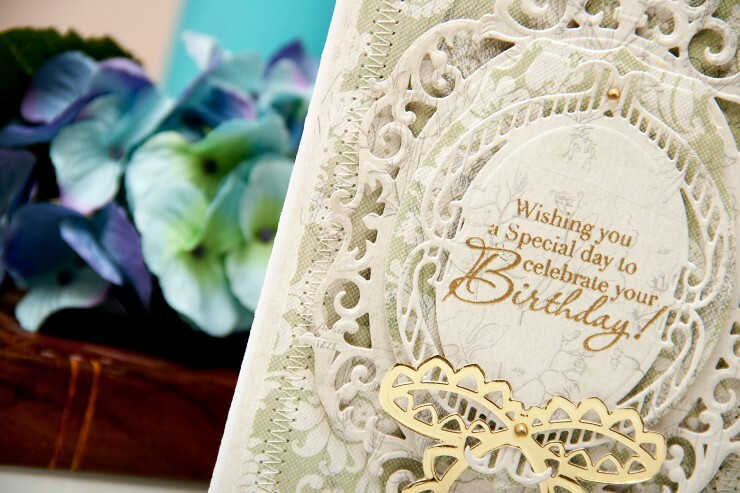 Such a beautiful and intricate card Yana! I love the little touch of gold against the neutral colors!